MICHAEL NELSON reckons he’s hungrier for success than ever before. The Easter Road outfit head to Ayrshire to take on Kilmarnock in the SPFL Premiership desperately needing to get some points on the board. They lost their first match of the new season, against Motherwell, then suffered defeat in the Edinburgh derby and earned a share of the spoils against Dundee United. It’s not been the best of starts but, having had to battle against the odds himself, he’s certain that Hibs can turn it around. Nelson has had to fight his way up through the ranks – even spending a spell as a blind fitter – to make it as a footballer. And he reckons that the experiences he has been through have made him appreciate his career as a footballer even more. Nelson had to find himself a job back in 2000 when, after a spell at Portsmouth as a YTS, he was told that his services were no longer required. It was a huge blow but instead of giving up on the game, he started fitting blinds and played non-league football in his spare time. And it paid off for him because, after a while, he was picked up by Bury and finally made the breakthrough he’d been waiting for. Nelson said: “Being rejected like that, and having to go out and work hard for a living, is something that made me a little bit hungrier and a bit more determined to succeed and make the most out of every opportunity that comes my way. Hibs got their first point last weekend against Dundee United and Nelson is keen for them to use that as a springboard to their season. “It was nice to finally get a point on the board,” he continued, “but we have to make sure that we build on that now. “That’s the important thing now and I am sure that everyone is just keen to go out and get the three points that we have been looking for over the last few weeks. That is what we are aiming for. “On a personal note, I am just looking to do my job week-in, week-out, and manage to do enough to convince the manager that I am good enough to stay in the team. It will be Nelson’s first trip back to Rugby Park since quitting Killie for Bradford City at the beginning of this year. He spent a year working under Kenny Shiels in Ayrshire, winning the League Cup, and, although his former manager is no longer in place, he is looking forward to meeting up with old friends and colleagues. But he insisted that he will prepare for this match in exactly the same way that he would any other. “I am looking forward to going back to Rugby Park and seeing a few familiar faces, on and off the pitch, I hope”, he continued. “Regardless of what game I go in to, I never try harder in one game than I do the other, so I will approach this match in the same way I would another match. Nelson is well aware that there has been unrest among the club’s supporters following their disappointing start to the campaign, and that pressure is being put on both Pat Fenlon and his squad. 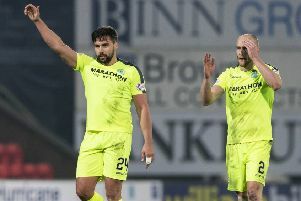 He believes that Hibs have not yet shown what they are capable of, but also feels that they have not had luck on their side either. He added: “The first two results of the new league season were really disappointing, especially the derby, for obvious reasons. “I thought that we did well enough to have take something out of both of the first two games. I think that we had more attacking options in the derby and could even have won that one. Despite the disappointment of failing to win a match in this campaign, Nelson insists that he and his team-mates are not feeling the heat of pressure any more than normal. “We have just been getting on with our job. The way that the game is in this day and age, any team that loses a couple of games finds themselves under pressure. “Everyone tends to look at the doom and gloom side of things, but it’s not like that in the dressing room. “You have got to understand that, at times, there will be little blips. “You can’t get carried away by winning two or three games in a row and, by the same token, you can’t get carried away by losing a few either. “It is still very, very early in the season and every one of the players is in a positive frame of mind and just looking to the next game as it comes along. Nelson is currently trying to finalise living arrangements in Edinburgh but, while he will be putting roots down in the city, his family will remain in the North East of England. He admits it is not an ideal situation but is hoping that he can turn his young sons into keen Hibbies with a few visits north of the border in the coming months. “My two boys are settled in school at the moment and I don’t really want to be moving them around at such an important time for them. “Bringing them up to Edinburgh and out of school would be a real upheaval for them and would take them away from their network of friends and family, too.